"When the wind blows, the cradle will rock." 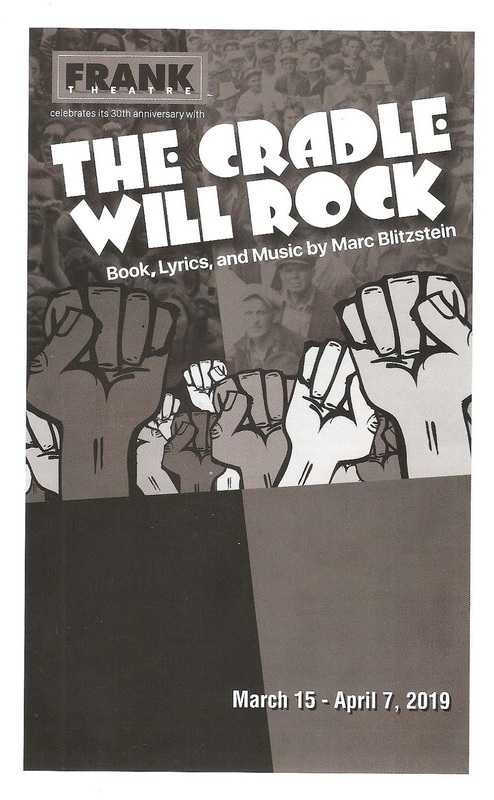 This sweet and innocent lullaby takes on a whole new meaning in Frank Theatre's production of the 1937 musical The Cradle Will Rock. Don't feel bad if you've never heard of it; I hadn't either, and really had no idea what I was getting myself into when I went to see it at Gremlin Theatre last weekend. For a piece that was so revolutionary at the time (the original production was shut down due to its pro-union stance and skewering of the power structure), it's still extraordinarily relevant. It feels like it could have been written in 2019. As usual, director Wendy Knox and her cast and creative team have created a manifestation of the written play that is incredibly detailed, thoughtful, consistent, and true to the message. And better yet, they do it in 90 minutes with no intermission. In the past I've had problems staying engaged for over three hours at a Frank show; no matter how good the play is, that's both a physical and a mental challenge for me. But 90 minutes seems the perfect length for this sort of thing. They fully but succinctly tell the story in an incredibly effective way, without the premise wearing thin or any redundancies. It's truly a rousing and gripping piece of theater (with music!) that will stay with you long after you leave the theater. The play takes place in fictional Steeltown, USA, which is run by a wealthy man named Mr. Mister. He controls everything - the newspaper, the university, the art scene, the hospital, the church, and his employees. His fashionable wife and spoiled entitled children are almost as obnoxious as he is (he's either Victor Newman, or some other wealthy powerful narcissist who's in the news every day). The play takes place at the city jail, with flashbacks and anecdotes about what got everyone there. Arrested citizens include an actual prostitute, and Mr. Mister's "Liberty Committee" who have sold not their bodies but their souls and morals to get into his good graces. They were arrested by mistake at a union rally, along with the union organizer. 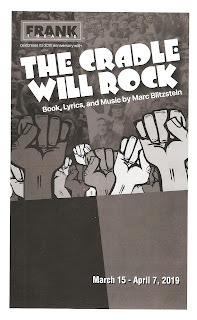 As we hear about all the horrible things Mr. Mister has done, and the things he has forced others to do in his relentless quest for money and power, the union organizer tries to rally everyone together, declaring "when the wind blows, the cradle will rock." The straight-forward presentation of this piece from 1937 makes it quite clear that not just in the world of the play, but in the real world, the wind is blowing, and the cradle is rocking. The more things change, the more they stay the same. 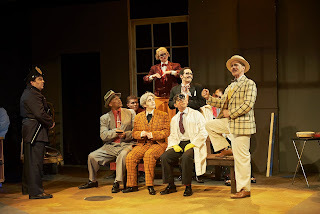 The musical is performed in a highly stylized, over exaggerated sort of style (which I'm beginning to think is what people mean by "Brechtian" #maureenimnotatheaterperson). Everyone in the 17-person cast fully commits to it, bringing us lots of crazed characterizations of these mostly horrible people. They function really well as a cohesive unit, and there's not a weak link among them. To mention just a few highlights, Kate Beahen brings a humanity and a crystal clear voice to the prostitute character, probably the most human and relatable character on stage. J.C. Cutler is gleefully evil as Mr. Mister, and Molly Sue McDonald is the embodiment of elegant evil as Mrs. Mister. Chelise Newhard and Sasha Andreev complete this disgusting but very entertaining family. And just truly everyone in the cast that I don't have time or space to mention here (check out the cast list here, they're all wonderful). I attended a talkback after the show (which I recommend, it's one of the good ones), in which the artists talked about many things, including playwright/composer/lyricist Mark Blitzstein's score. They talked about how complex and unusual it is, and how it references music of the era. All I know is that it sounds beautiful and funny and clever, with some interesting unexpected ryhthms and melodies, and the ensemble pull it off beautifully (singing and occasionally playing instruments) under Music Director and pianist Sonja Thompson. And I like that there aren't a whole lot of obvious applause breaks; the music and dialogue/scenes flow more organically. The look of the show is also very consistent with the tone - bright and colorful and exaggerated. The whimsical set (designed by Sara Herman) includes removable signage to mark locations and a darling push car. 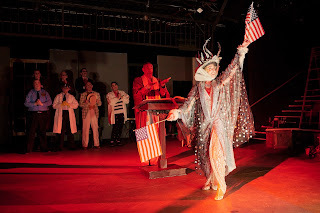 Costumes (designed by Kathy Kohl) are big and bold and very specific to character (my favorites are Mrs. Mister's parade of gorgeous elegant dresses that go just a little too far). Bold, cartoonish make-up completes the look. Frank Theatre is celebrating their 30th year, bringing back a re-staging of this popular show from 2003. It's a great example of what they do best - a classic piece of theater that's still hugely relevant and speaks directly to the world we live in, very thoughtfully and thoroughly performed in a very stylized and consistent way. Check them out at Gremlin Theatre in St. Paul through April 7.